On a Saturday where college football saw seven Top 25 teams all suffer shocking upsets—including four in the Top 10—boxing needed to do a lot better than simply go chalk. As an unbeaten prizefighter whose home base is deep in football country, Terence Crawford had to understand that better than anyone else. It took more than 11 rounds for Nebraska’s one man pro sports franchise to deliver, but in the end Crawford gave the hometown fans in Omaha plenty to cheer about and sports outlets something better to write about than a routine title defense. An explosive stoppage finish of Jose Benavidez Jr. with 18 seconds to go in their ESPN-televised headliner sent the sold-out crowd at CHI Health Center Omaha into a frenzy, a reaction par for the course whenever Crawford fights at home. That it nearly went the full 12-round distance would not have been a good look for the sport’s reigning pound-for-pound king, or for boxing in general. It was already a rough day in the industry, with the second week of World Boxing Super Series Season Two offering a pair of unwatchable quarterfinal matchups from Russia and with ESPN’s headlining act coming with Crawford as a 33-1 favorite by the opening bell. Rising featherweight prospect Shakur Stevenson did his part to break from the norm, exploding in a 1st round knockout over a normally durable Viorel Simion, who’d never previously been dropped. It set the stage for Crawford, and for much of the night proved to be a tough act to follow. Crawford was never in any real danger of losing, although Benavidez Jr.—who’d traded harsh words with the unbeaten champ all week and nearly blows at Friday’s weigh-in—made things far too interesting through the first six rounds. In fact, the unbeaten challenger from Phoenix was ahead one card after five rounds and just one point down on another. Much of the pre-fight talk around the industry focused less on this matchup and more on when Crawford would start facing welterweights “on the other side of the street” like Errol Spence Jr., Keith Thurman, Shawn Porter, and Danny Garcia. To put it mildly, Crawford was expected to blow through Benavidez Jr.—who returned to the sport earlier this year after suffering a gun shot and came in to the bout with his right knee in a supporting brace—and send a message to the wolves starting to circle the corral. The unbeaten switch-hitter finally began to pull away in the second half of the night, although still failing to manage any better than a solid boxing performance. It’s not enough when you are hailed as the best boxer in the world and defending against a perceived overmatched opponent. 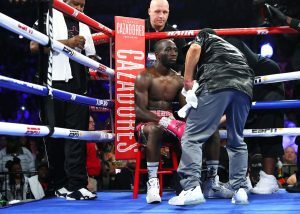 Crawford sensed it as the bout wore on, perhaps never more than when his mother Debra shouted from ringside at the start of round 10 that he needed to end the fight. That moment wouldn’t come for another two rounds, and it even took for the 31-year old to ignore the theme of his corner’s instructions during the one-minute rest period, where he was told to play it safe and leave with the win—but to take his shot if he saw an opening. The manner in which he fought the rounds suggested that Crawford wasn’t interested in waiting for an opening; he instead punched a hole through the wall. After missing twice earlier in the round with right uppercuts, it was that very punch which functionally put an end to Benavidez’s brave stand. It produced the lone knockdown of the night, coming with less than a minute to go in the fight, but just enough time for Crawford to register his fight straight stoppage victory. A flurry along the ropes left the normally elusive Benavidez Jr. out on his feet, leaving referee Celestine Ruiz no choice but to end the fight with 0:18 left on the clock. Had Benavidez Jr. managed to bob and weave just long enough to hear the final bell, Crawford would’ve cruised to a landslide decision victory. He was up 107-102, 108-101 and an unacceptable 110-99 at the time of the stoppage, but on a night where—by his own admission—he had a hard time early on solving his opponent’s deceptively slick style. Mind you, it’s not as if decision wins are commonplace for Crawford, who has now scored five straight stoppages and with nine of his 12 career title fights ending inside the distance. But going the full 12 rounds against a largely immobile opponent who’d never lived up to his full career promise wasn’t going to be good enough on this night. It wasn’t going to be good enough for industry fans who continue to grow frustrated over the politics of the sport depriving the talent-rich welterweight division of the best fights. It wasn’t going to be good enough in the eyes of the top PBC welterweights who—between lucrative network deals on Showtime and Fox prime—can continue to face each other, and now with former eight-division champ Manny Pacquiao sweetening the pot. It certainly wasn’t going to be enough to sports fans in a crazed college football town are in dire need of a new hero, as the still winless Nebraska Cornhuskers (0-6) are off to their worst start in their 129-year history. With that final offensive explosion, Crawford didn’t just do his job but showed off his ability to deviate from the norm. Serving as the hero to so many of those around him means everything, a feeling you can sense whenever he speaks to the outpouring of support he receives at home and every time he climbs the turnbuckle at fight’s end. On a night when there was so much else to talk about in the sports world—the slew of college Football Top 25 upsets, Major League Baseball playoffs—Terence Crawford found a way in the end to once again keep boxing at the heart of discussion.